The Twitter addicts amongst you may have noticed that I took a quick trip to Paris last month (90% of my tweets from my trip were about how I was lost in St Pancras train station, so apologies for that…). A few journalists and bloggers (including me, Helen from Fuss Free Flavours and Margot from Coffee and Vanilla) were whizzed across the channel by the lovely people at Teisseire for a stunning lunch at Porte 12 (supposedly Paris’ best kept secret). If you’re not aware of Teisseire, they are a French company who produce beautiful flavoured syrups (or sirops, for those of you who are more continental), which have recently been launched in the UK. You can use the syrups like cordial, just mixed with water, or you can use them in cocktails, desserts, coffee, etc. They’re pretty versatile, and come in all sorts of flavours. One of the words in the above lists stands out to me as more exciting than the others (hopefully you agree): cocktails! 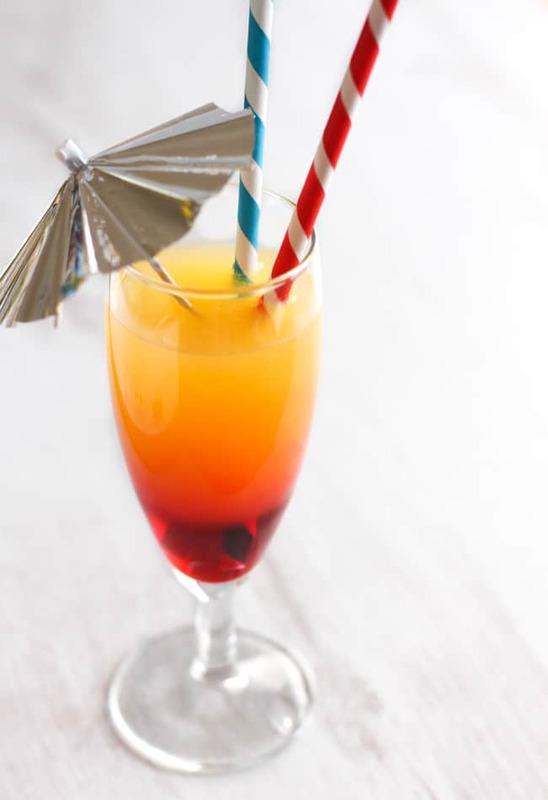 I thought I’d use the grenadine flavoured syrup to make a rather pretty layered mocktail (alcohol-free cocktail) with orange juice and lemonade. If you’re more inclined towards alcohol, I also tried making the same drink using Chambord raspberry liqueur instead of the syrup, and that worked fine too. It does require a little bit of experimentation, but here’s my attempt at explaining how to make a layered cocktail or mocktail. The key to making layered drinks is to first choose what order you need to pour the layers in. Unfortunately, this isn’t as easy as just picking which colours look pretty next to each other. The order that the layers will settle in is decided by the relative densities of the liquids – i.e. heavier liquids are going to sink to the bottom. If you want really distinct stripes in your cocktail or mocktail, pour the densest liquid first, working your way up to the least dense. Or, if you want your layers to bleed into each other a little, pour the least dense liquid first, and as the denser liquid trickles to the bottom, the layers will combine a little. I appreciate that that sentence contained the word ‘dense’ about seventeen times, but I’m afraid I’m not stopping just yet. Just a few more to come. So, how on earth do you figure out which liquids are the densest? Let’s start with the alcoholic version, since let’s face it, we all know that’s where a lot of us are going to be ending up. Different alcohols have different densities. 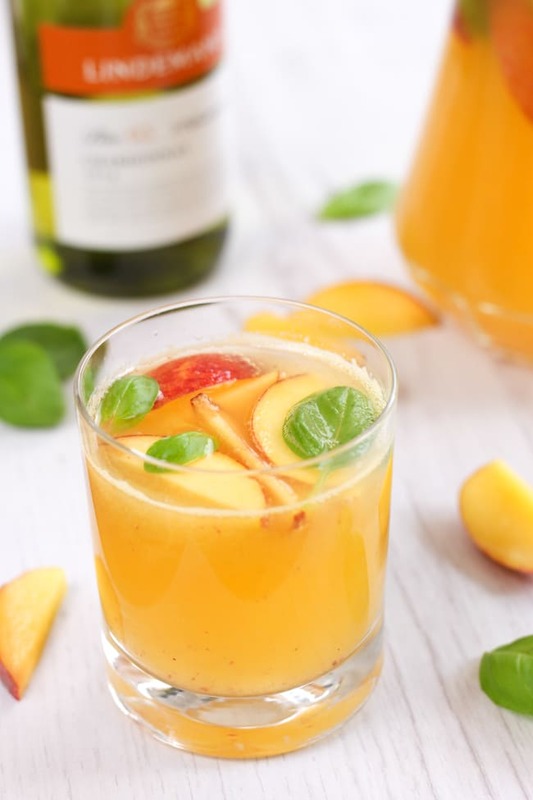 As a general rule, thicker, sweeter alcohols like fruit liqueurs are going to be denser than stronger, purer alcohol like spirits. If you Google ‘specific gravities of alcoholic drinks’, there are several pages which list the densities of different types of alcohol (here‘s one that looks pretty thorough!). The bigger the difference between the densities of the drinks you choose, the better they will be at creating distinct layers. When layering soft drinks, it’s all about the sugar content of each drink, which is easy to find as it’s usually clearly displayed on the back of the bottle. Drinks with a high sugar content are going to be heavier than low-sugar drinks. Again, the bigger the difference, the better the layers will be. Right, so you’ve chosen the drinks that you want to layer up. If you just pour them all in willy nilly, you’re going to end up with a big mess – even if you pour them in the right order. No, you need to pour very gently to make sure the drinks don’t just all mix together. Here’s a great technique that I found worked really well. Start by pouring your first layer (usually the heaviest liquid, unless you want the layers to bleed together a little). 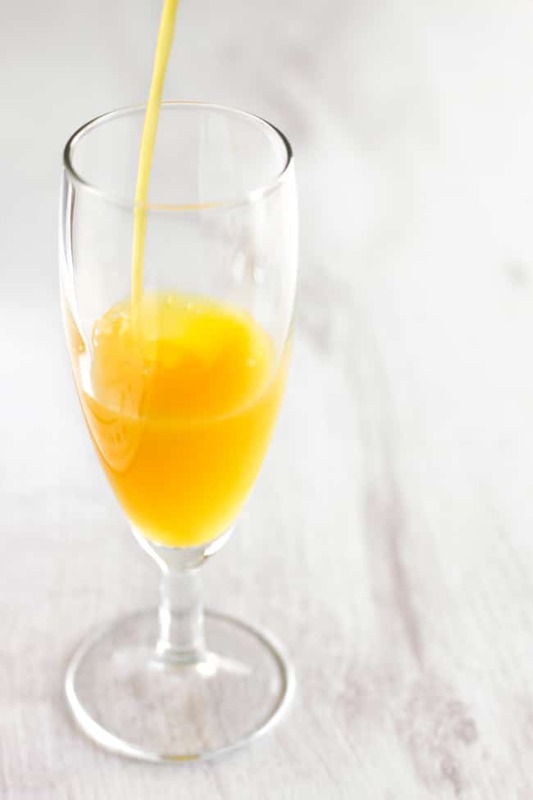 I started with orange juice. You don’t need to be careful here, just get it in the glass. Next, balance a spoon face down inside the top of the glass, above the level of liquid (see the photo below for a clearer explanation, since I am finding it hard to word today). Gently pour the next liquid over the back of the spoon. Gently, I said! 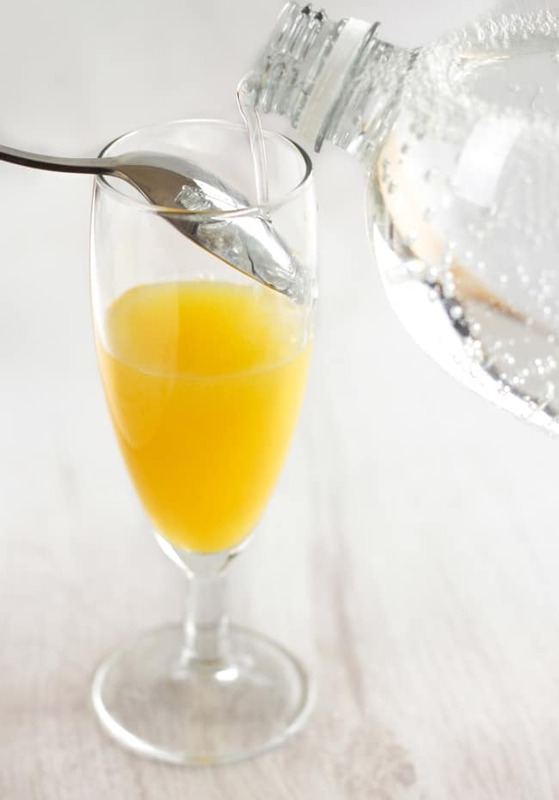 I used diet lemonade (low sugar –> sits on top of the sugary orange juice). It’s hard to see the layers with these two drinks because they do bleed together a bit, but the layers become more obvious once you add the third layer. 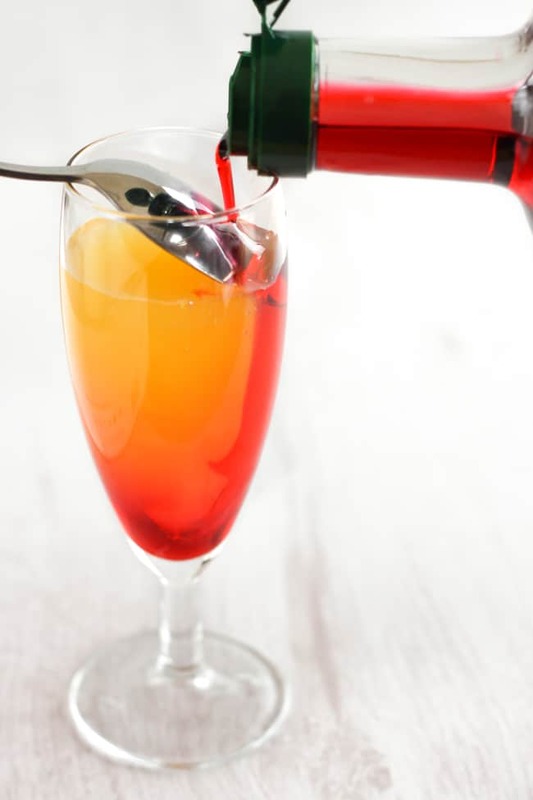 The third layer I poured, the grenadine Teisseire syrup, was actually the densest liquid, meaning it sank to the bottom underneath the layers I’d already poured. I found that this gave the best effect with the colours I was using – you will need to experiment to find the best order to pour your layers. Again, use the spoon, and pour very slowly and gently. And there you have it! 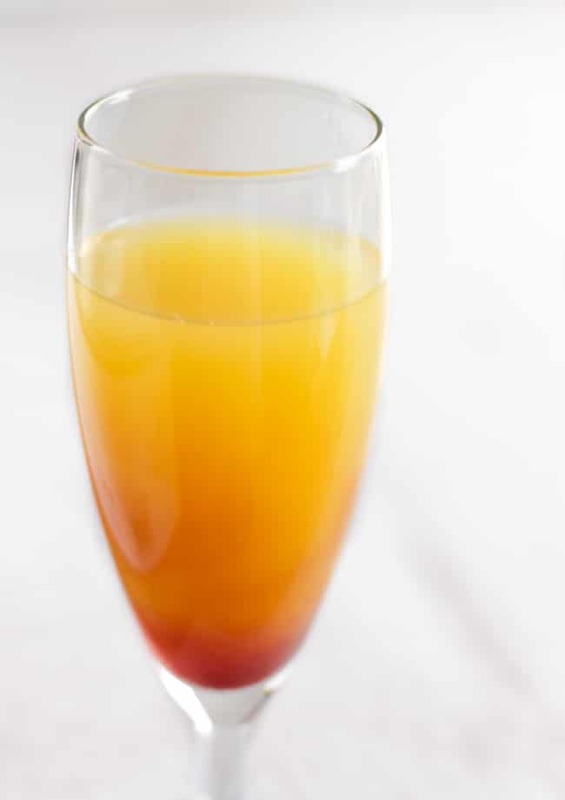 As you can see, the grenadine clings to the orange juice more than it clings to the lemonade, giving that orange colour in the middle. I also tried an alcoholic version as well, using Chambord raspberry liqueur instead of the grenadine syrup. It gave a similarly beautiful effect, but with less distinct layers. Once you’ve got your cocktail, you can either drink it the classy way, sipping it slowly with your little finger stuck out, orrrr you can stick some umbrellas and straws in it and drink it the fun way, as cocktails are meant to be drunk. Note: this is not a sponsored post. I was not paid to write this post, but I was taken for a lovely lunch in Paris by the folk at Teisseire. It really easy and fast to to make a layered cocktail. Thanks for sharing. 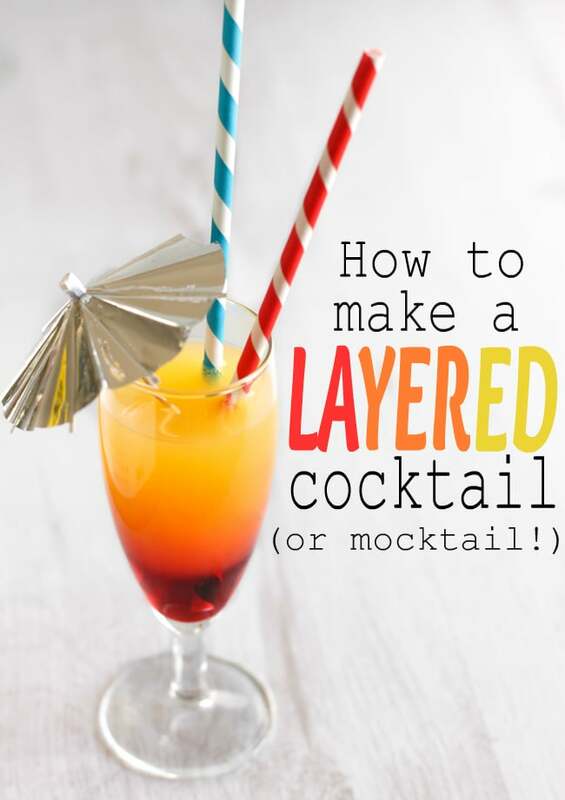 I just read it twice to figure out all the process to make layered cocktail, thanks for the guide. Will you give me the article link where you mentioned about trip that you “lost in St Pancras train station”, just asking because I want to know the incident, it’s quite funny and scary too. hahaha, sorry :). I’ll come back to check your reply. I thought there is a article about it, but good to hear it from you via comment. I searched for twitter fan page, and following you, you probably get notification with fitnesspell name, that account I use for twitter. I told you, I’ll come to check the reply :p.
I don’t know why people think that mocktails are boring. It’s not always the alcohol that makes it fun! That said, I have been trying this trick myself and while I’m still a little messy, the extra bit of effort makes my drink just a little more special. Looks delicious and great fun. I need that umbrella now.. Looks so cute and perfect on the drink. 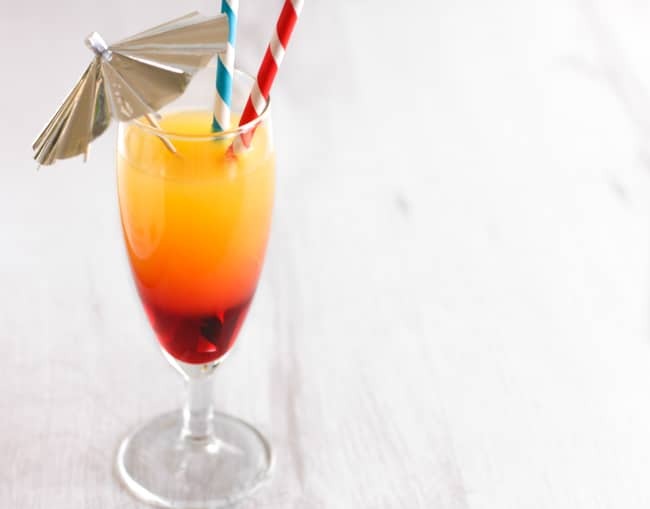 Great tips here Becca, I’ve always wondered how to get the layers in a cocktail, will have to do some experimentation this summer! Love the tips! I always love the look of a layered cocktail! I never know how to make those layered cocktails so this is fab! Will definitely be making these this summer. Maybe with a splash of vodka for the adults!! Have pinned! 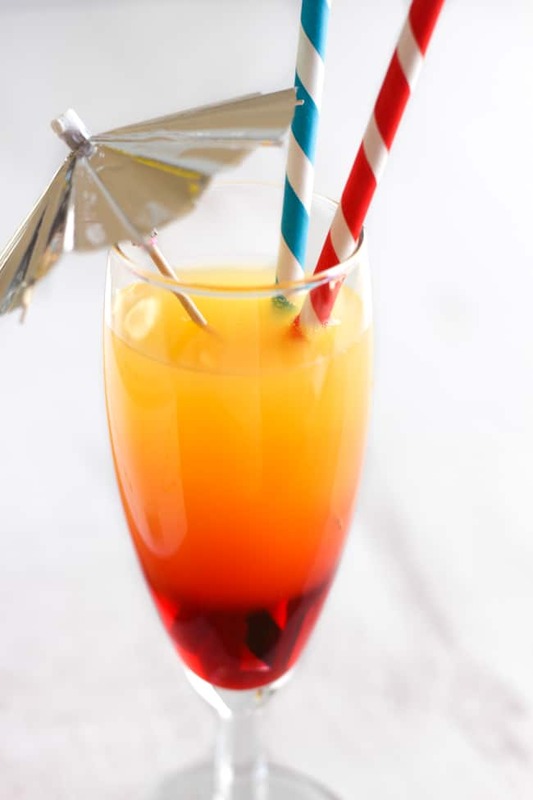 I remember my dad making my mum tequila sunrise this way, using the back of a spoon when I was wee. I used to watch totally fascinated. He probably made them as much for my awe as for my mum. What a fabulous lesson in layered cocktails and brilliant shots. The syrops sound amazing! Looks delicious, also love the sound of your trip to Paris. As an aside, where did you get those straws? They’re amazing! I’ve never made a layered cocktail, looks pretty easy thanks to you! I can’t wait to try this! you make it look so simple…which i suppose is why you are writing this blog post and I would be writing a pinterest fail post whilst absolutely off my rocker from my failed attempts that have been glugged down! Saying that you also make me want to try it out with your simple to follow instructions! So I am hosting a uni friends reunion this summer and guess what will be featuring? Becca, I agree there’s a lot of experience required for the layering of cocktails.